Le Sr. Alexandre LE BORGNE, seigneur du lieu, 43; Daelle. Marie de ST. ESTIENNE his wife age 32; children: Emanuel 11, Marie 9, Alexandre 7, Jeanne 5; Estienne AUCHER, servant. 65; children: Michel 26, Francois 20; 3 guns, 20 arpents, 16 cattle, 17 sheep, 6 hogs. Le Sr. Dantrexmon Philipe MIUS, royal prosecutor, 77; children: Philippe 24, Magdelaine 16; 40 arpents. children: Claude 23, Jacques 19. Marie 18, Henriette 12, Paul 11, Charles 10, Martin 9, Pierre 5, Anne 2; 2 guns, 12 arpents, 22 cattle, 10 hogs. Jeanne 12, Marie 7, Magdelaine 5, Elisabet 1; 1 gun, 13 arpents. 8 cattle, 6 sheep. Michel DUPEUX 57, Marie GOTRO his wife 49; children: Martin 21, Pierre, 17, Jean 10, Marie 7; 5f arpents, 6 cattle, 2 sheep. Francois RIMBAULT 30, Marie BABIN his wife 25; 1 gun 11 cattle. Charles BABIN 22, Magdelaine RICHARD 15; 2 cattle. Charles GOTRO 25, Francoise RIMBAULT his wife 20; child: Francois 7 months; 1 gun, 7 cattle. Mathieu MARTIN 47; 1 gun, 8 arpents, 8 cattle. Guillaume 19, Jean 17, Jean-Charles 15, Jeanne 12, Magdelaine 9, Marie 14; (children with Pierre) Susanne Joan 2 months; 2 guns, 8 arpents, 10 cattle, 10 sheep. Rene RICHARD 28, Magdelaine LANDRY 29; children: Michel 5, Anne 4, Antoine 2; 1 gun, 5 arpents, 10 cattle, 10 sheep. Pierre RICHARD 24; 1 gun 5 arpents, 10 cattle, 10 sheep. Jean DOUARON 37, Marianne CANOL 35; children: Abraham 14, Charles 12, Jean 8, Philippes 4, Pierre 6, Jeanne 8, Noel 2; 1 gun, 7 cattle, 1 sheep. Rene LANDRY 52, Marie BERNARD 42; children: Claude 23, Jean 20, Rene 18, Germain 12, Abraham 8. Pierre 6, Cecile 22, Marie 16, Marguerite 14, Jeanne 10, Catherine 4, Anne 2; 2 guns, 10 arpents, 16 cattle, 20 sheep. Antoine LANDRY 26, Marie THIBODEAU 25; children: Marie 4, Antoine 2, Isabelle 1; 2 guns, 9 arpents, 8 cattle, 6 sheep, 10 hogs. Francois BROUSSARD 33, Catherine RICHARD 22; children: Magdelaine 5, Pierre 3, and a daughter who has not yet been baptized 11 days; 1 gun, 7 cattle, 6 sheep, 5 hogs. Claude DUGAS 38, Francoise BOURGEOIS 25; children: Marie 12, Claude 10, Francoise 6, Joseph 6, Marguerite 5, Agnesse 1, Jeanne 3; Anne 7; 1 gun, 8 arpents, 25 cattle, 9 sheep, 11 hogs. Germain TERRIOT 23, Anne RICHARD his wife 15; 1 gun, 6 arpents, 6 cattle, 8 sheep. Francoise 4, twins Pierre and Ambroise 10 month; 1 gun, 6 arpents, 20 cattle, 12 sheep, 6 hogs. Pierre COMMEAU (widower) 88; children: Jean 21, Pierre 25, Antoine 24; 6 arpents, 4 cattle, 12 sheep, 4 hogs. Bernard BOURC 36. Francoise BRUN 34; children: Marie 15, Marguerite 13, Rene 9, Anne 8, Jeanne 6, Claire 4, Francoise 3, Abraham 1; 1 gun, 3 arpents, 4 cattle, 6 sheep, 6 hogs. Martin BLANCHARD 38, Marguerite GUILEBAULT 18; children by his first marriage (Francoise LEBLANC): Francoise 14, Marie 12, Rene 9; 1 gun, 3 arpents, 9 cattle, 12 sheep, 7 hogs. 5 arpents, 13 cattle, 16 sheep, 8 hogs. Julien LORD 33, Charlotte GIROUARD 26; children: Alexandre 10, Jacques 8. Pierre 5, Marie 1. 5 cattle, 6 sheep, 2 hogs. and 5 others who are married; 2 guns, 12 arpents, 16 cattle. 30 sheep, 8 hogs. 4 arpents, 14 cattle, 21 sheep, 8 hogs. Guillaume 3, Denis 2 months; 2 guns, 3 arpents, 10 cattle, 18 sheep, 10 hogs. Antoine 1; 1 gun. 12 cattle 12 sheep, 10 hogs. Francois GOTRO 71, Emee LEJEUNE 61; 3 guns, 4 arpents, 8 cattle, 5 sheep, 8 hogs. Claude GOTRO 27, Marie TERRIOT 20; child: Marie 6 months. Pierre ARSENAULT 40, Marie GUERIN 24; children: Pierre 10, Abraham 8. Claude BERTRAN 35, Catherine PITRE 18, they live at Cap de Sable. Francois TOURANGEAU 42, Marie PITRE 22; child: Jeanne 2. Nicolas BARILLOT 40, Marie HEBERT 28; child: Marie 2. Jeanne ROUSSILIERE, widow of GODIN, dit Chatillon; children: Gabriel 25, Pierre 20, Anne 13. Rene RIMBAULT 70, Anne Marie 61; children: Rene 12, Anne 15, Magdeleine 11; 1 gun, 8 arpents, 6 cattle, 5 sheep, 6 hogs. Jacques GIROUARD 38, Marguerite GOTRO 32; children: Alexandre 16, Pierre 14, Jacques 12, Jean 10, Francois 6, Claude 3, Guillaume 3 months, Marie 8, Marguerite 4; 6 arpents, 13 cattle, 15 sheep. Jean BLANCHARD 75, Radegonde LAMBERT 65. Jeanne 5, Anne 2; 4 guns, 5 arpents, 16 cattle, 20 sheep. 1 month, Marguerite 11, Marie 6, Anne 5, Catherine 3; 3 guns, 6 arpents, 25 cattle, 30 sheep, 15 hogs. Jean HEBERT 32, Anne DOUCET 22; children: Jacques 9, Pierre 7, Jean 5, Joseph 2 months, Jeanne 3. Antoine HEBERT 72, Genevieve LEFRANC 80. Daniel LEBLANC 60, Francoise GODET 60; 2 guns, 6 arpents, 15 cattle, 20 sheep, 7 hogs. Andre LeBlanc 26, Marie DUGAS 19; child: Jean 2. Pierre LEBLANC 21, Marie TERRIOTt 21; child: Pierre 1. Rene LEBLANC 29, Anne BOURGEOIS 25; children: Jacques 6, Francois 4, Rene 2. Antoine LEBLANC 24, Marie BOURGEOIS 21; children: Antoine 4, Charles 2. Jacob BOURGEOIS 67, Jeanne TRAHAN 57; child: Guillaume 31; 20 arpents. Jean 3, Anne 1; 4 arpents, 4 cattle, 10 sheep. Abraham DUGAS 70, Marguerite DOUCET 50. Jacquette 13, Marie 8; 4 hogs. twins Claude and Jean-Baptiste 3, 1 gun, 2 arpents, 9 cattle, 12 sheep. Magdelaine 8, Catherine 6, Jean-Baptiste 3; 1 gun, 12 arpents, 16 cattle, 15 sheep, 12 hogs. Abraham BOUDROT 30, Cecile MELANSON his wife 16; 2 guns, 5 cattle, 15 sheep. Thomas VINCENT 20, Michel VINCENT his brother 18. Germain DOUCET 45, Marie LANDRY 35, Bertrand 19, Laurens 16, Jacques 15, Claude 12, Marie 8, Jeanne 6. Alexis 4, Pierre 1; 5 arpents, 9 cattle, 10 sheep. one girl 2, one girl 1 month. Jeanne 10, Estienne 8, and two other children; 4 arpents, 6 cattle, 4 hogs. Jean PRIJEAN 35, Andree SAVOYE 21; child: Marie 2; 2 guns, 1 arpent, 1 hog. Nicole COLSON 80. Jean GODET her son 45, Jeanne HENRY his wife 30; children: Francoise 13, Jean 12, and three other children by his first wife; 1 gun, 4 arpents, 4 cattle, 4 sheep, 3 hogs. Jacques LEPRINCE 40, Marguerite HEBERT 35; 4 children; 5 sheep, 3 hogs. Olivier BOUDROT 25, Isabelle PETITPAS his wife 17; 4 cattle, 6 sheep. Claude 8, Marie 6, Anne 2; 1 gun, 3 arpents, 8 cattle, 6 sheep, 6 hogs. Antoine BOURC 95, Antoine LANDRY 80; child: Marguerite 18. Francoise BOUDROT, widow of Estienne ROBICHAUD, 42; children: Prudhomme 17, Marie 14, Alexandre 11, Francois 9, Charles 19; 4 arpents, 6 cattle, 7 sheep, 6 hogs. second marriage: Marie 4, Jeanne 1; 2 guns, 4 cattle, 10 sheep, 17 sheep, 4 hogs. Nicolas BARILLOT 36, Martine Imbert (HEBERT) 20; child: Marie 2 1/2; 1 gun 3 sheep. Jean de BASTARACHE 25, Huguette VINCENT 22; child: Marianne 7 months. Anne 7, Pierre 5; 1 gun, 5 arpents, 13 cattle, 9 sheep, 8 hogs. Abraham 7, Marie 4, Magdelaine 4, Jeanne 2; 4 arpents, 10 hogs. Antoine 10, Magdelaine 8, Francoise 5, Jean 2; 1 gun, v 1-1/2 arpents, 10 cattle, 12 sheep, 8 hogs. who is not baptized; 1 gun, 4 cattle, 10 sheep. 8, Renee 6; 5 arpents, 10 cattle, 10 sheep, 8 hogs. Laurens GODIN 32, Anne GUERIN 26; children: Pierre 8, Marie 6, Guillaume 4, Anne 5 months; 7 cattle, 7 sheep. Estienne COMO 35, Marie-Anne LAFEUBINE 35; children: Catherine 14, Alexandre 12, Marie 10; 1 gun, 9 arpents, 10 cattle. 15 sheep, 6 hogs. Joseph 5 months; 1 gun, 10 cattle, 10 sheep, 6 hogs. Jean-Baptiste 1; 3 arpents, 8 cattle, 12 sheep, 8 hogs. cattle, 10 sheep, 8 hogs. 18 months; 1 gun. 3 arpents, 7 cattle, 8 sheep, 6 hogs. arpents, 4 cattle, 5 sheep, 6 hogs. Anne-Marie 16, Pierre 16, Jeanne 14, Jean 13, Antoine 12, Pierre 10, Michel 8, Cecille 6, Anne-Marie 4, Claude 2; 1 gun, 10 arpents, 14 cattle, 5 sheep, 7 hogs. Isabelle 11, Charles 9, Marie 4, Jeanne 1; 1 gun, 8 arpents, 8 cattle, 6 sheep, 8 hogs. Marie 8, Isabelle 6, Cicille 4, Marguerite 1; 2 cattle, 2 sheep 1 hog. Pierre 18, Rene 16, Gabriel 13, Marie 11, Jean-Baptiste 9; 1 gun, 5 arpents, 8 sheep, 4 hogs. Antoine 16; and Elarie Garault 9; 3 arpents, 4 sheep, 3 hogs. Marguerite 6, Mathieu 1; 2 guns, 5 arpents, 8 cattle, 12 sheep, 6 hogs. 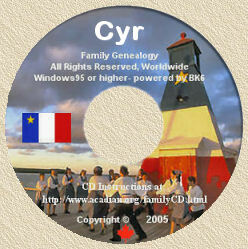 Jacques LAPERRIERE (LePrince) 40, Marie SAVOYE 30; children: Pierre 9, Magdelaine 7, Nicolas 4, Alexis 2. Summary of the census of Port Royal: 592 persons; 95 families. 197 men and women, 218 boys, 177 girls, 75 guns, 643 cattle, 377 arpents of cultivated land, 627 sheep, 351 hogs. 3; 4 guns, 4 cattle. Abraham DUGAS 23, Jeanne GUILBAUDE 18; 2 guns, 2 cattle. Summary: 15 persons, 16 guns, 7 arpents of cultivated land, 17 cattle. Jacques PROVOST 48, Jeanne FOUCAUX his wife 40; and Jacques PETIT, volunteer, 28; 3 guns, 2 arpents, 1 hog. Jean LABAT, inhabitant of La Petite Riviere de La Halve, 50. Pierre LEJEUNE, dit Briars, 28; Marie TIBAUDEAU his wife 25; 6 guns, 1 arpents. Martin LEJEUNE 25, Jeanne his wife who is an Indian; children: Claude and a girl (ages not reported). Francois MICHEL 35, Magdelaine GERMON 40, and Charles GOURDEAUX, a servant, 40. LAVERDURE 35, his wife 25, and one child (no age reported). PETITPAS 25, his wife 18. Summary of la Halve and Miriguaiche: 19 persons, 9 guns, 3 arpents of cultivated land, 1 hog. day old; 12 guns, 50 arpents, 31 cattle, 8 sheep, 27 hogs. Martin AUCOIN 35, Marie GAUDET 27; children: Martin 12, Marie 10, Michel 9, Isabelle 7, Louis 6, Agnesse 4, Alexis 3, Cecille 7 months; 1 gun, 15 cattle, 10 sheep, 6 hogs. arpent, 1 cow, 3 sheep, 3 hogs. Francois LAPIERRE, dit laRoche, 38; Jeanne RIMBAULT 24; children: Francois 5, Marie 3, Jacques 1; 1 gun. Philippe PINET 32, Catherine HEBERT 24; children: Jean 6, Antoine 4, Noel 3, Marie 1; 2 guns, 8 arpents, 12 cattle, 15 hogs. Philippe TERRIOT 32, Cecile LANDRY 22; Jacques MARTIN servant (no age reported), 1 gun, 16 arpents, 9 cattle, 8 hogs. Estienne RIVET 34, Marie COMMEAU 24; children: Rene 8, Marie 6, Estienne 3; 3 cattle, 1 hog. Claude BOUDROT 23, Rnne-Marie TIBODEAU his wife 20. Estienne HEBERT 32, Jeanne COMMEAU 24; children: Antoine 6, Marie 4, Estienne 1; 2 guns, 8 arpents, 7 cattle, 7 hogs. Claude LANDRY 23, Marie TIBAUDEAU 18; a child one year old; 12 cattle. Summary of the census of Baye des Mines: 57 persons, 20 guns, 83 arpents of cultivated lands, 90 cattle, 21 sheep, 67 hogs. Martin D'APRENDESTIQUE, dit Martignon 70, Jeanne LATOUR his wife 60; child: Marianne 24. Le Sr. DAMOURS D'echofouc 32, Marguerite GUION his wife. Le Sr. Mathieu DAMOURS de Frencuse 28, Louise GUION his wife. Le Sr. de ST-AUBIN and his wife; his older and younger sons and a few servants. ESORCIS who also lives at this river. Martel DUBREIUL and a few servants. Le sieur de ST CASTIN and several servants. LEGER 55, GABRIEL 20, Michel LARCHE 22, Marie LAGASSE 16; and Me. PERTUIS, gunsmith; 70 guns, 60 arpents, 19 cattle, 22 sheep, 12 hogs. Francois 4, Estienne 3, Jeanne 2; 3 guns, 25 arpents, 18 cattle, 8 sheep, 30 hogs. LABARRE 50, his wife 46, Marie his daughter 5; 1 gun, 3 arpents, 3 hogs. Germain GIROUARD 30, Marie BOURGEOIS 34; children of Marie BOURGEOIS and Pierre CIRE (her first husband): Jean 15, Pierre 8, Guillaume 6; (and by her second husband:) Germain Girouer 4, Agnes 7 months; 1 gun, 4 arpents, 8 cattle, 3 sheep, 4 hogs. Charles 12, Marguerite 10, Jean 8, Jacques-Francois 3; 30 arpents, 15 cattle, 8 sheep, 12 hogs. Alexis 3 months; 2 guns, 8 arpents, 20 cattle, 4 sheep, 14 hogs. Jacques COCHU 26, Marie MORIN 20; child: Pierre 3; 2 guns, 6 arpents, 4 sheep, 6 hogs. Jean-Baptiste 3, Louis 2; 1 gun, 7 arpents, 13 cattle, 3 sheep, 8 hogs. Robert COTTARD 40, Susanne JAROUSELLE 40; child; Pierre 6; 1 gun, 2 arpents, 2 cattle, 1 sheep, 1 hog. marriage:) Joseph Mercier 5, Magdelaine 3, Alexandre 2, Marie-Joseph 6 months; 1 gun, 40 arpents, 6 cattle, 4 hogs. Roger QUESSY 35, Marie POIRIER 35; children 16, Jean 10, Pierre 8, Guillaume 6, Michel 1 1/2; 2 guns, 8 arpents, 18 cattle, 6 sheep, 8 hogs. Germain BOURGEOIS 34, Magdelaine DUGAS 22; children: Guillaume 12, Marie 9, Michel 7, Magdelaine 3; 2 guns, 5 arpents, 8 cattle, 3 sheep, 4 hogs. LAVALLEE 48, Marie MARTIN 23; children: Marguerite 3, Genevieve 1; and of LAVALLEE's first marriage there are 8 children; 2 guns, 40 arpents. 20 cattle, 12 sheep, 15 hogs. Pierre 6; 2 guns, 12 arpents, 2 cattle, 8 hogs. 40 arpents, 15 cattle, 18 sheep, 20 hogs. Marie 12, Germain 10, Pierre 8, Angelique 4, twins Marie and Jeanne 1; 4 guns, 40 arpents, 30 cattle, 10 sheep, 15 hogs. 8 cattle, 4 sheep, 6 hogs. Claude DUGAS owns at Beaubassin: 30 arpents, 8 cattle. Summary for Beaubassin: 127 persons, 102 guns, 426 arpents of cultivated land, 236 cattle, 111 sheep, 189 hogs. Le sieur RICHARD Denis de Frousac, seigneur of Miramichy, and four or five servants. Le sieur de la BOULAIS, royal lieutenant, in the fort at the lower end of the hay with 15 or 20 servants. In the place are 3 or 4 inhabitants who are clearing the land. ENAUD 35, his wife who is an Indian and 3 or 4 servants. He is cultivating land and raising cattle. 4 children - LEGASCOU and his wife - LE BASQUE, Pierre and his wife. cultivated land, 759 sheep, 608 hogs. Secondary Source #1: Book entitled 'Acadians in Exile' by Reverend Donald Hebert. Secondary Source #2: Book entitled 'The Acadian Families 1686' by Winston DeVille [English Translation].